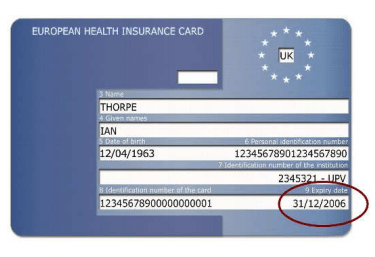 Some of you may rely upon the EHIC (formerly the E111) medical card for your medical cover whilst in Spain, and there is a good chance that your UK visitors will carry one. “Holidaymakers are being urged to renew their European health insurance cards (EHIC) as millions are due to expire by the end of the month. Although nearly three in five people claim to have an EHIC, 68% of these do not know when it runs out, says a poll for the Department of Health. The survey also suggests many people who fall ill when abroad do not seek help for fear of the costs. This is despite the free or reduced cost healthcare offered by the EHIC. The card provides access to healthcare in all 25 European Union countries, plus Iceland, Norway, Switzerland and Liechtenstein, on the same terms as the country’s own citizens. By the end of this month, some 3.3m cards will have expired since September 2008. GMTV doctor Hilary Jones, who is fronting the Department of Health campaign, said: “If you’re travelling in Europe, it is vital that you carry a valid EHIC, as well as comprehensive travel insurance. “The last thing you want to be thinking about when you’re on holiday is paying unnecessary medical bills, which could cost thousands of pounds.